September 28th 2016 - Addison, Texas—Inez Muhleman spent a lifetime of service to golf and saw the game grow right before her eyes. Muhleman, 95, passed away on Wednesday morning from complications of lung cancer. Muhleman, who was known as ‘Nez to her close friends, was born in Donalsonville, Ga. and attended Georgia Southwestern State University in Americas, Ga. After college, Muhleman taught for a little over two years before joining the military when World War II broke out. She was stationed at Fort Benjamin Harrison in Indiana, which is where she met her husband, Tom. After the war Tom and ‘Nez settled down in Atlanta and joined Atlanta Country Club, which is where ‘Nez started getting involved in junior golf. Though she had been playing since she was 19, ‘Nez enjoyed giving back to the game that she enjoyed so much. In 1970 Tom’s job, Gulf Oil, relocated him and ‘Nez to Houston, Texas from Atlanta and the two joined Riverbend Country Club in Sugar Land. ‘Nez began serving on the U.S. Girls’ Junior Committee, overseeing the U.S. Girls’ Junior sectional qualifiers, and served six years on the Women’s Texas Golf Association board, serving as President in 1982. In 1986 Muhleman created the Girls’ Junior Travel Fund for Texas-based qualifiers. The fund began as a $250 donation of her own money and quickly grew into a fund that provided reimbursement for airfare and caddie fees to every Texas qualifier, which has helped more than 350 girls. In 2011 she received the Joe Dey Award, which is an award presented by the United States Golf Association for meritorious service to the game as a volunteer. Muhleman accepted the award not just for herself, but for all the many, many volunteers throughout the country. ‘Nez estimated that she had put in 1,500 days of volunteer service when she received the award. Muhleman attended every U.S. Girls’ Junior from 1980-2010. In her 31 year volunteer career she watched and helped numerous golfers go on to success in her favorite sport. Golfers like Kellie Kuehne, 1994 U.S. Girls’ Junior champion, Brittany Lang, Stacy Lewis, Angela Stanford and Wendy Ward were all helped by Muhleman on their way to the LPGA Tour. In 2008, the WTGA created a scholarship program to raise funds to ensure the investment in young women continued for many years to come. The scholarship was named for ‘Nez Muhleman and Doris Kallina, two women who have given their time, energy and resources to promote women’s golf in Texas. 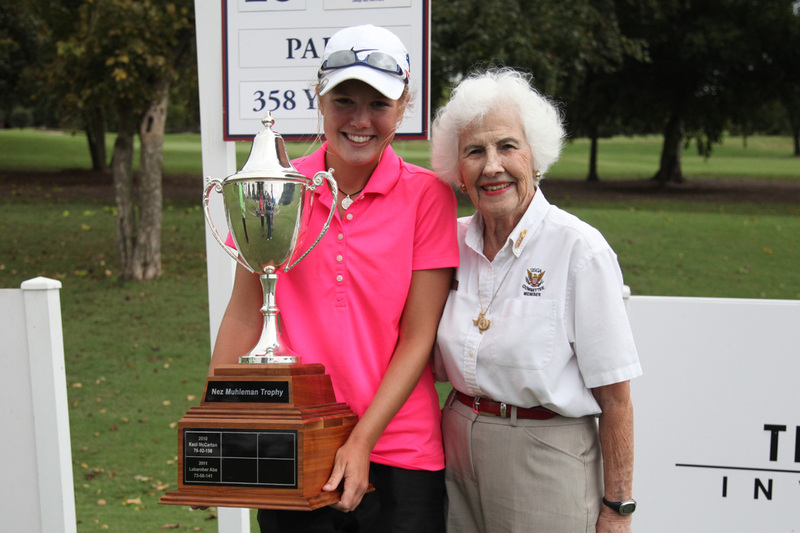 Muhleman stayed active around the Houston area in recent years, attending several USGA qualifiers and Legends Junior Tour Texas Girls’ Invitationals, which awards its winner with the ‘Nez Muhleman Trophy.